A police officer has attracted social media praise after buying food for two homeless men. PC Gavin Parrott says he was inspired by the "community spirit" in Nuneaton to help out the rough sleepers. While on duty on Sunday, PC Parrott went for a walk on the town to try and find some people in need. After hearing that one of the men had slept in a doorway throughout that night, he offered to take them to McDonalds for something warm to eat. He was spotted by a member of the public, who posted about it on Twitter and urged others to thank the Warwickshire constable for his good deed. 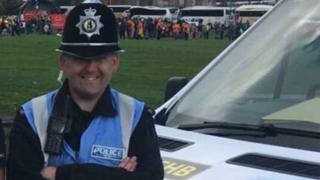 PC Parrott, 40, has worked as an officer in the town for three years. He said: "I had seen other people in Nuneaton doing similar things. "Because I am a community officer, I decided I would have a walk around the town and check on the homeless community. "I thought I could just nip in and out but someone spotted my collar number and then found my Twitter account." PC Parrott said lots of people in Nuneaton had been offering a helping hand to the homeless and other people who have been stuck because of the snow. He said: "It is something anyone could do to help, it is not something I did because I am a police officer. "The response is not what I do it for, but it was really nice that people took time out of their day to send me a message."